A couple of years ago I was searching the internet for do-it-yourself tomato cage designs because the funnel shaped cages that you find in home improvement stores are worthless if your tomatoes grow over a couple of feet tall. My search led me to this post on GardenWeb which shows how to make garden arches and vegetable supports our of cattle panel. The wheels started turning and cattle panel became my favorite farm store product. Cattle panel sections are 16 feet long and four feet high and are available at most farm stores. I got mine at a chain farm store in McKinney. If you bend the panels end to end into a teardrop shape and tie the ends with wire, you can slide them into the bed of a standard pickup truck. Watch out when you take them out and remove the wire. Cattle panel can be cut to size with bolt cutters. The smaller 14 inch bolt cutters work OK, but the larger 24 inch cutters give better leverage and make cutting the thick wires much easier. The cut ends are rather sharp, so it is a good idea to smooth them off with a grinder. My cages were initially four feet tall. Two sides of the cages were cut two squares wide and the other two sides were cut three squares wide. It is hard to tell from this photo, but I removed the bottom horizontal wire between each vertical wire with bolt cutters. This creates spikes on the bottom of the cage that can be stuck in the ground. So far, that is all I have needed to keep the cages from falling over. If the cages ever get too top heavy and start to lean, I can attach a stake or two to the cages. I attached the cut sections together using hog rings. The open hog rings are closed using hog ring pliers. This photo shows a hog ring joining two sides of the tomato cage. The hog rings remain a little loose which allows me to fold the cages flat at the end of the growing season. Last year I quickly discovered that four foot high tomato cages are not tall enough, so I added an extension to one of the cages. The extension brought the height to a little over 6 feet. I got around to extending the other cage this year. This photo was taken 05-02-13. Something else I discovered last year was that I needed some internal support for the tomato vines. Once the plants began to set fruit, the weight of the tomatoes caused the vines to slide down inside the cage. This year, I placed a scrap piece of cattle panel inside the cage and it seems to have done the trick. This was a very good year for tomatoes. I picked quantities of tomatoes similar to this every couple of days for several weeks. The tomatoes in the glass containers are frozen. I had to start freezing them because there were so many. Eventually, I will build new tomato cages. When I do, I will cut the sections of cattle panel lengthwise so I will not need to add an extension piece. I think 7 foot tall cages should be sufficient. This year I made an asparagus cage to help confine my second year asparagus plants. In May, the asparagus shoots were beginning to fall over and block the pathways between my vegetable beds. I cut four lengths of cattle panel and placed them around the asparagus bed. I thought I would need posts to help support the asparagus cage, but all I did was wire them together with galvanized wire. The wire will be easy to remove at the end of the season. This will allow me to store the cattle panel sections and remove the dead asparagus shoots. This is the side yard on the west side of the house and driveway. It is also my last patch of lawn. Once it is gone, I think I may add cattle panel trellises with a vine (maybe green beans or gourds) to help shade this wall from the western sun. I am also thinking about a location for a cattle panel arch in the vegetable garden. Thanks to everyone that attended my speaking engagement at the Timberglen Branch of the Dallas Public Library. It was a small, but interested, group. I ended up having a little more material than I had time and that got me a little flustered as I tried to get through everything as quickly as possible. In my haste, I skipped (forgot) a few points that I intended to make. All in all, though, I think it went pretty well. I was even asked if I would come back again next year. I told the wall to wall crowd of eight that I would post some of the links and information that I mentioned. Let me know if there is other information that you would like me to post. For additional internet resources, check the links that I have in the right margin and the Blog Links tab under the header photo. For part of the presentation, talked about the seasonal changes that take place in my garden. To demonstrate these changes, I showed a few photos from each season in 2012. 07-18-13 There are going to be A LOT of gayfeather blooms this fall. The remaining little bluestem grass looks much better than it did last year. It is blue instead of brown. 07-18-13 Maybe not a lot of differences in this view, other than the stock tank was relocated. The plants look similar in growth, if not a little larger in 2012. 07-18-13 Pine Muhly surrounded by more gayfeather. 07-18-13 I captured a grainy image of a hummingbird feeding on red yucca flowers. I think this bench may be calling me to sit a spell and enjoy the garden this weekend. I may listen if it is not too hot and the mosquitoes are not looking for some warm blood to feast upon. I accepted an invitation to speak about my garden at the Timberglen Branch of the Dallas Public Library. At least that is the plan. I may get nervous, freeze up and have a staring contest with the audience. This is my first (and maybe last) time to speak in public about my garden. Actually, it is my first time to speak in public about anything, other than work related events. I was asked to talk about the whys and the hows of my garden. Why I did it, how I did it and how I keep it looking good. I am working on a PowerPoint presentation that will include lots of pictures to will facilitate the discussion. They would like me to speak for 30-40 minutes and have a Q and A session afterwards. As of today, my presentation is titled: Lawn Free - Landscape With Purpose. I was working on a theme song to the tune of Born Free, however I have been told that I should stick to the topic and leave out the singing and humor because I am not that good at either. I stopped by the library yesterday to take a look around. The building is gold level LEED certified. 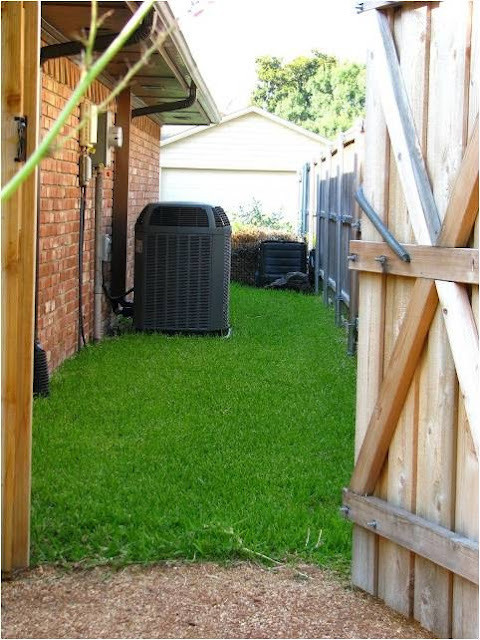 Some are the "green" features are the use of natural lighting and a cistern to capture rainwater for landscape use. I noticed some native plants in front of the building. If you would like to hear my presentation, it will be this Thursday, July 18 at 7:00 PM in the library auditorium. The auditorium is just to the right as you walk through the front doors. The library is located at 18505 Midway Road and is easy to get to from the George Bush Turnpike or the Dallas North Tollway. Let me know if you attend because you read about it here. Speaking of libraries and native plants, check out the butterfly garden at the Bulverde/Spring Branch Library in Bulverde, TX as featured recently on Central Texas Gardener. This would be a great educational addition to the Timberglen Branch Library. Watch Sharon Lovejoy's My First Bird Book on PBS. See more from Central Texas Gardener. Natural materials, such as decomposed granite, can enhance the beauty and functionality of a garden. 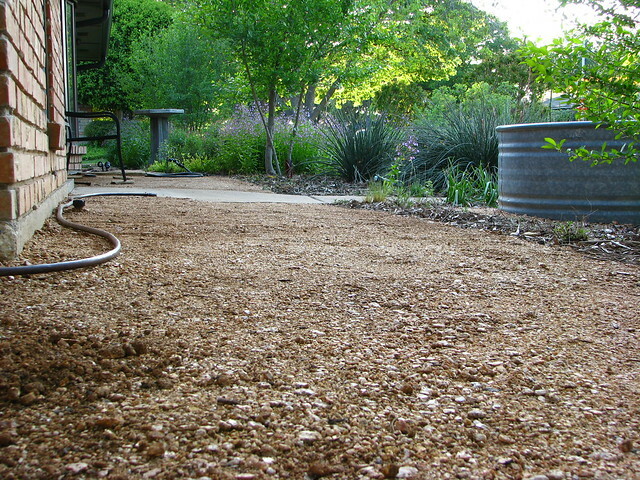 I use decomposed granite for pathways and open areas throughout my garden. This year, I widened part of a pathway in the backyard to create a more open feel to the garden. In the front yard, I created a front porch effect with decomposed granite on both sides of the front door. I made my first decomposed granite pathways four years ago. When I was ready to complete the projects above and add pathways along the sides of my garden this year, I returned to the same bulk landscaping materials dealer for more. I expected the new decomposed granite to look a little different from the old because it fades a little due to exposure to sun and weather. Unfortunately, the new decomposed granite had a different color, texture, and higher clay content. It turns out that my dealer changed from a supplier in Marble Falls, Texas to a supplier in Oklahoma. This is a shot of my old granite from Marble Falls. The material had a pinkish tint and looked like crushed granite. This is a picture of the decomposed granite from OK that I purchased earlier this year. This decomposed granite originally had more of a golden brown color and faded once washed to light pinkish orange. This decomposed granite has a fine texture and a very high clay content. I was able to get several truckloads over the course of a couple months, but I had to remove a layer of existing decomposed granite from my pathways and replace it with the new decomposed granite to have some consistency through the garden. I used the layer of old decomposed granite that was removed from the pathways as a base for the new pathways. Just when I was about finished with my projects and needed two more truckloads of decomposed granite, my supplier ran out. When I returned the following week, the decomposed granite was a bright golden yellow color! Ugh! This really does not match. Fortunately, I still had a pile of the decomposed granite that I had been buying over the last few weeks in the driveway, so I used the new yellow stuff as a based and covered it with the decomposed granite that was in the driveway. But I still needed one more load. I decided to try a different bulk supplier in Plano. They had two piles of decomposed granite. A pink pile and a yellow pile. The pink pile looked similar to what I had and they said it came from OK, so I took a chance. Well, it was a rosy pink and not a match. To get some consistency through the garden, I colorized all of my decomposed granite with a thin layer of the rosy pink stuff. This is the side yard connecting to the backyard. Opening the gate and looking into the front yard, the pathways are fairly similar in color. The flagstones at the gate are a bunny barrier. They love to get into the backyard. Looking the opposite direction from the front yard into the backyard. So this week's gardening tip is to remember that natural materials are, well, natural and will have natural variations in color, size, and consistency. If at all possible, get all of the material that you think you will need at one time to improve your odds of having consistent material. Also remember that your supplier may change material sources which can also result in variations in material. Next time, I think I will use pea gravel because it always seems to be the same size and color. unless you choose to live under the tyranny of a homeowners association. Happy Independence Day to my fellow citizens of the United States of America. Happy Thursday, July 4, 2013 to the rest of the world.